Porous pavement is a hard surface that can support some vehicular activities, such as parking and light traffic, and which can also allow significant amounts of water to pass through. Porous pavement is widely used in parking lots, and allows water to drain through the pavement surface into a stone recharge bed and infiltrate into the soils below the pavement. How does Porous Pavement Work? There are many types of permeable materials such as pervious concrete, porous asphalt, porous paving stones or porous bricks. All of these permeable materials allow precipitation to percolate through areas that would traditionally be impervious. The precipitation infiltrates through to the soil below usually in the form of an underlying, open-graded stone bed. As the water drains through the porous surface and into the stone bed, it slowly infiltrates into the soil. The stone bed size and depth must be designed so that the water level never rises into the porous surface. What are the Advantages and Disadvantages of Porous Pavement? 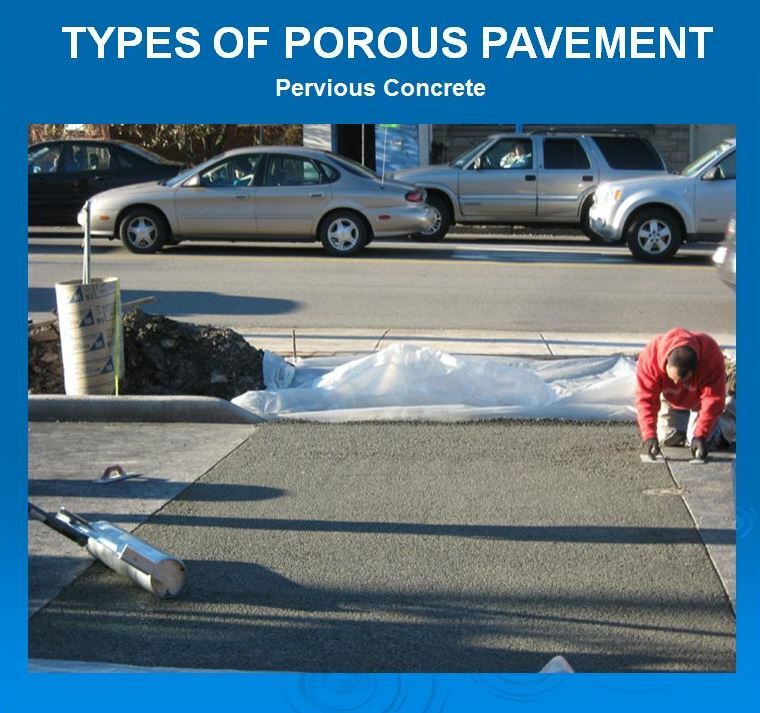 What are some different types of Porous Pavements? Porous Flexi-Pave® Tree Pit (click here). Porous Asphalt FAQ’s (19 May 2011) (click here). Stormwater Management Fact Sheet: Porous Pavement (click here). Porous Asphalt Fact Sheet (click here). Hydraulic Design of Permeable Pavements (click here). Porous Pavement Uses (click here). Green Infrastructure Practices: An Introduction to Permeable Pavement (click here).